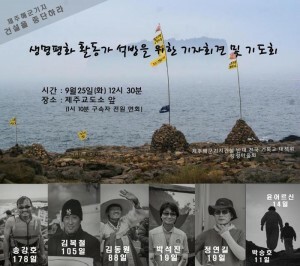 In the last few weeks, four more men have been jailed for actions taken in opposition to the Korean navy base under construction at Gangjeong, on Jeju Island. On September 6, as the controversial World Conservation Congress (WCC) convened nearby in Jungmun, five people climbed onto the Samsung-made caisson dock at Hwasoon port in protest of the naval base. Samsung is the prime contractor for the project, and also principle sponsor of the WCC. The WCC refused to condemn the on-going destruction of the Gureombi Rock coastline, a World Heritage site. Of the five, Rev. Jeong Yeon-Gil and Mr. Park Suk-Jin were jailed. A few days later, Gangjeong villager Mr. Yoon Choong was imprisoned for damaging private property, namely the shop of a rare navy-friendly business in the village. Finally, Mr. Park Seung-Ho was imprisoned because he did not respond to a police summons on the matter of a related protest of Hanjin, another industrial contractor. These men now join Dr. Song Kang-Ho, Mr. Kim Bok-Chul, and Mr. Kim Dong-Won, already serving sentences in the Jeju jail for protest against the naval base. Letters of support should be sent to the men at the addresses listed here, Inside & Out.